What is another word for interpretation? The act of explaining the meaning of; explanation; translation. rendition, notion, assumption, opinion, formulation, sense, vision, rendering, version, justification, assessment, ambiguity. 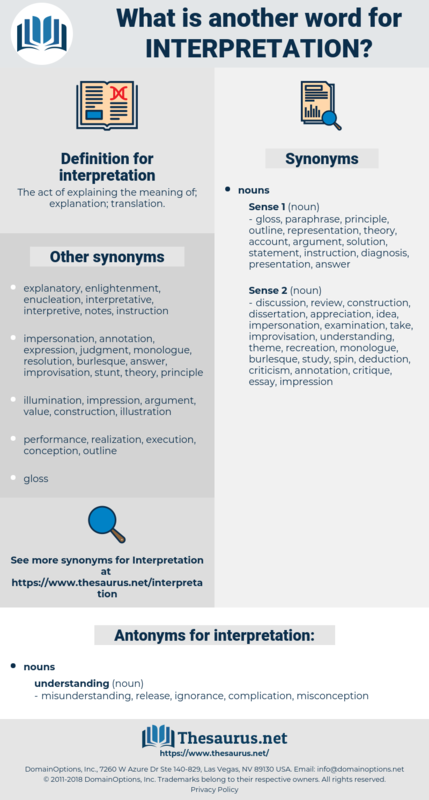 statements, interpreting, interpret, interpreter, interpreters, translation, definition, definitions, interpretative, interpretive, understanding, understandings. 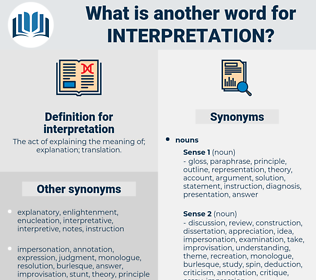 interpreting, characterization, elucidation, perception, interpretation-related, interpreter, translation, view, definition, definitions, narrative, conception, interpretative, appreciation, expression, purpose, interpretive, position, assertion, presentation, significance, understanding. misunderstanding, release, ignorance, complication, misconception. It is the form which it assumed, the interpretation of experience which it gave, not the facts themselves, obscure but stubborn as they are, which it confessed, that we have dropped. Did they not admit the most extraordinary interpretation? clarification, misinterpretation, reconstruction, literal interpretation, popularization, misunderstanding, exposition, expounding, exegesis, construal, ijtihad, version, elucidation, popularisation, reading, mistaking, eisegesis, construction, twist, illumination.